Troutman, NC – Major developments are occurring on the north end of Lake Norman and Troutman is posed for significant growth over the next 5 years. From housing to shopping, changes are coming. 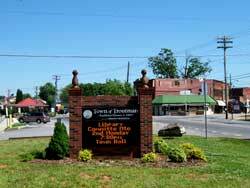 Troutman is located north of Mooresville, NC. on Interstate #77, at Exit #42 (route #115), 32 miles from “Up Town” Charlotte, and then 2 miles west to Troutman.